You may have pursued the arts thinking you are exempt from the nitty-gritty of the business world. This, however, is a misconception. At the very least, the one thing you cannot avoid is the resume. A resume summarizes your list of skills and qualifications for any job; keyword any. This includes professions relating to the arts. 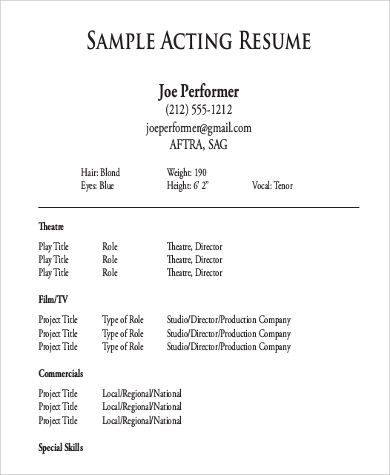 As an aspiring actor or actress, even a resume is a basic requirement. You take one with you to auditions or screen tests. The whole point is the same: your resume should sell what you have to offer. 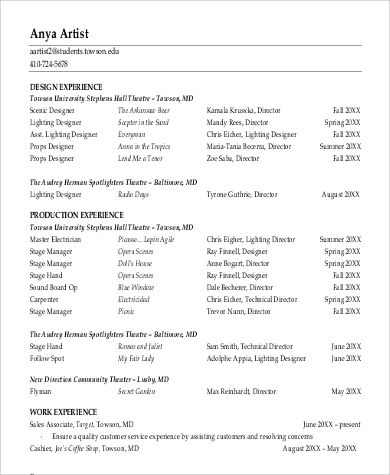 Specifically, however, theater or actor resumes are formatted rather uniquely. 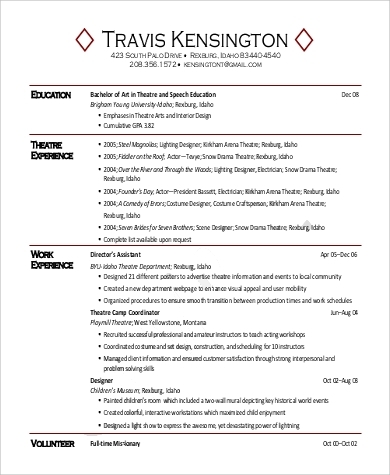 To guide you, see these Sample Resumes. The assumption is that you just go to audition after audition, hoping for a callback, and eventually a role. One would think that such a process is devoid of paperwork and documentation apart from the scripts and the lines, but a resume is still actually a requirement. 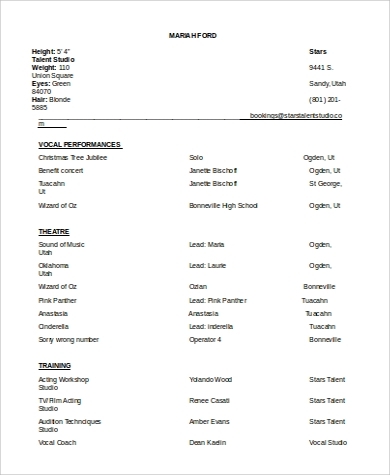 Basically, it should be formatted as these Sample Acting Resumes. 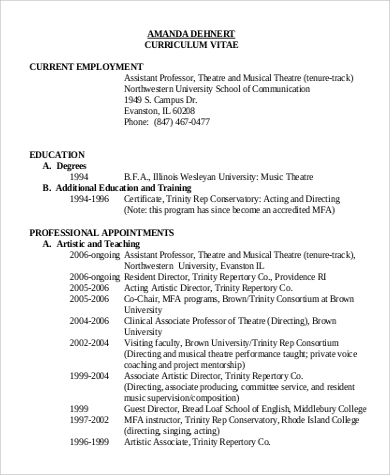 All other jobs in the performance arts require these resumes too. 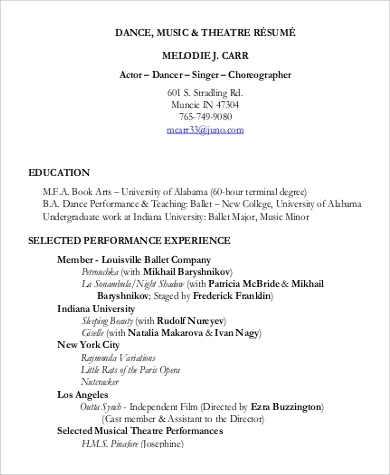 For instance, dancers like in these Sample Dance Resumes. For applications in this industry, resumes should put the spotlight on a talent’s experience, skills, and qualifications. That said, do not be in a hurry to pen out the typical chronological or functional resumes, because a theatre resume differs in a lot of ways. A performer’s calling card in this industry is his or her headshot. 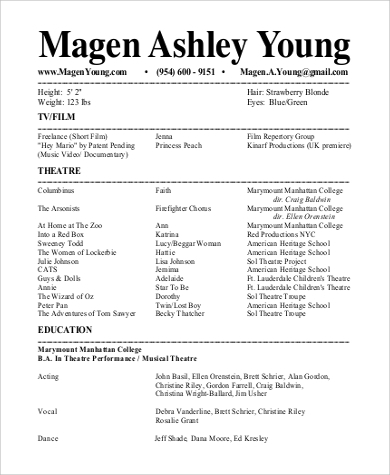 What most people do not know, however, is that attached or stuck behind the headshot is the actors’ or actress’ theatre resume. The first rule to take note of is that these two always come together and should never be apart. as dramatic as black and white photographs can be, your headshot should be in full color. As for the the theatre resume, it should follow the following guidelines. HeaderYour resume starts with your name, in bold. Beneath it, indicate your expertise. For instance “actor-writer,” “actor-ballet dancer,” or just “actor” or “actress.” If you have an agent, this should be followed by his or her contact information. If not, just put in your own. Remember to use a professional, rather than a personal e-mail, because landing jobs in this industry is still a professional process. Associations or AffiliationsThese are acting guilds or groups that you belong to, if any. This section is a good reference point for your work. Physical FeaturesActing is a very visual art. Include this section to let casting directors determine whether you look the part or if you look appealing to audiences. Acting ExperienceThis is the most important section of your theater resume. Start the list with the biggest role you have had. 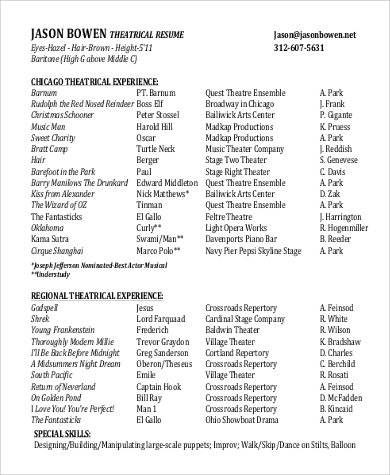 For every item on this list, specify the production, the role you played in it, and its director. 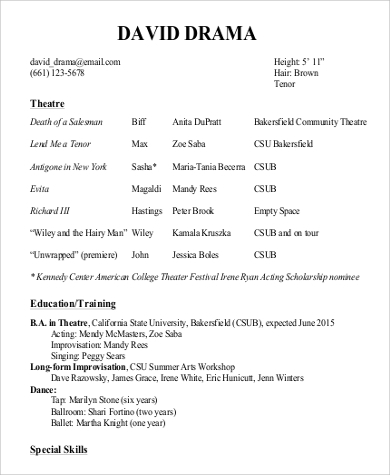 Artistic TrainingIf you trained in an acting school, indicate where and when. 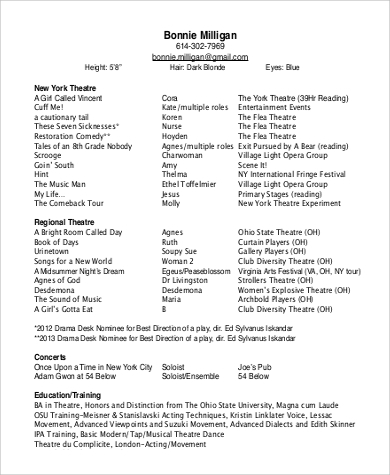 Include acting programs you may have attended here too. Since it is attached at the back of your 8 × 10 headshot, all these details should be found in a single page. To guide you further, see these Resume Templates.